Very privileged to be covered a second time Malaysia's number one online Christian media outlet. I get a lot of people asking me for prayer for family members, either for healing or to know Jesus. A while back, I used to continually pray for my brother to know Jesus. Sounds great, but I was doing it religiously, until one night the Lord spoke to me in a dream and showed me a series of events that was going to unfold in my brother’s life which were ultimately going to bring him to an encounter with Jesus – amen! – and thus gave me peace knowing and believing full well that he was in the Lord’s hands. So rather than keep praying religiously, I declared agreement with what I’d received and believe by faith that which the Lord has shown, because His purposes are brought about by faith. So now, when people ask me for prayer on behalf of others, I ask the Lord to give them something that they can claim by faith. Below are a couple of testimonies from people whom I’ve prayed for in this circumstance sharing what the Lord showed them. Left are Pastors Brian and Lynne Heath from City Builders Church, 10 Wade Court, Sale, Victoria 3850, Australia. While in a coffee shop in town, I mentioned that the Holy Spirit had told me that Brian had a problem with his left shoulder, and he confirmed it, so I laid my hand upon his shoulder and God made him drunk in the Holy Spirit and completely restored his shoulder – In the coffee shop – How awesome. I visited a friend and, while I was there, her ten year old daughter was showing me drawings that God had shown her in visions and, as I turned to the last page that she had drawn, there was a picture of a heart, and inside it were the words ‘God’, ‘Jesus’, ‘Holy Spirit’, ‘faith’, ‘blessing’, ‘kindness’, ‘hope’, ‘bible’, ‘love’, and ‘peace’, all in separate compartments. I asked her what it meant, and she replied, “That’s what Jesus is going to make my heart look like.” So I then asked her to draw a picture of what her heart looked like now. So she drew another picture of a heart with compartments, but this one had a large compartment in the middle with the word ‘sadness’ written inside. So I asked her where the sadness came from, and she said that she had been sad for that long that she just didn’t know. I knew that her parents had separated when she was very young and felt that this was the cause, so I asked her when she thought Jesus was going to heal her heart and make it look like the original picture as He had told her, and she just shrugged her shoulders. So I told her that I believed that He was going to do it right now! So I asked her mum to pray with me and I cast out the spirits of sadness, heartache, hurt and grief. When we had finished I asked her what Jesus had done as we prayed, and she said that she felt all the sadness leave her body! Amen! 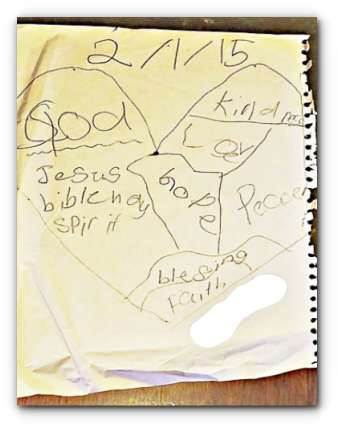 And then she drew me a picture for me to take home of how Jesus had mended her heart as we had prayed for her – how awesome! Praise God. During a meeting in Barnard Castle, a guy asked me to pray for his knee and the Holy Spirit told me that the pain was going to travel down his leg, into his ankle and eventually into his foot and then at that point he must stamp it out! So by faith, I declared that to him and, as I prayed for him, that’s exactly what happened! Praise God! I told him the Devil is under his feet. I stood up to pray for someone else and the man pulled me back and then said that because he had been over compensating with his other leg, his foot was hurting on the other leg. So while I prayed for the other foot, I heard the Holy Spirit tell me that he just needed to stamp it out of that foot too! So, by faith, I told him to stamp it out! And God healed his other foot as well. Wow, isn’t God just amazing! Completely the opposite to our natural thinking. I took Kev to Byker City Fellowship International in Newcastle once, the requests were coming in a steady stream for prayer, one woman said she had a frozen shoulder, but then revealed some years previously she had an accident that damaged a bone, Kev told her that the pain would travel down her arm and when it reaches her wrist, she must shake of the devil and as he prayed she confirmed that her pain did exactly that! Kev said, “Give it a good shake!” And as she did, she confirmed the pain had gone and her shoulder was healed. 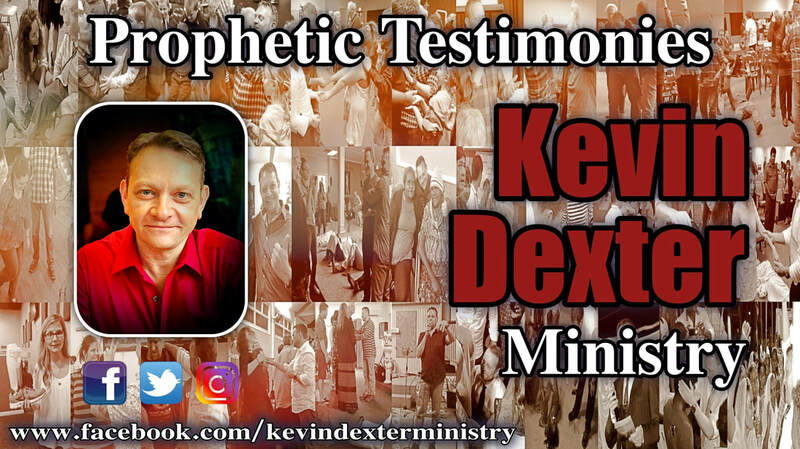 Kev prayed for the Pastors wife, who had a slight pain and deafness in her left ear, He rebuked the pain and demanded all negative words to depart before blowing a light breath into her left ear, proclaiming life and then she was healed! I was totally in awe of how the Holy Spirit was working bringing healing and deliverance through Kev. ​During the Freedom Party conference in the US, I was invited forward to pray for people and, as I moved forward, an angel revealed to me where other people’s pains were; so, by faith, I mentioned that I knew there was someone with a pain slightly offset to the back of their neck, and a woman came forward saying that she had been in great pain for some time in that exact place. At that moment, I felt the anointing come over me. To everyone else, I probably looked like a drunken man but, as I laid my hand on the back of her neck, she was instantly healed. Then she collapsed on floor with a smile on her face. It was so obvious that it was all God because I was actually struggling to stand up myself. Then the angel showed me that there was someone with a pain in their left wrist and, again, as I mentioned it, a woman came out of the congregation with a splint on her left wrist and, as I prayed, she began to regain the movement in her hand and went on to remove the splint as she received the healing. Amen! A guy asked for prayer in a meeting for a lump on his arm that he was really concerned about, I looked around for someone to pray with me to encourage their faith and hearing but the only person available was his daughter, who was about 5 or 6 years old. So I asked her to lay her hand on her father’s leg (which is all she could reach) and to close her eyes and tell me what God shows her while I pray. As I prayed, I felt the lump going down a little under my hand and then his daughter shouted out that God had shown her that her daddy was going to be healed and receive new skin on it, and then she shared the most amazing description of her dad riding a heavenly rainbow of promise! Don’t you just love it when kids move in the Holy Spirit. While ministering at Freedom Church in Cwmbran, Wales someone asked me to pray for healing and they also wanted a confirmation on something that they were pondering on doing. I love to encourage other people to pray so, at that moment, I asked God to show me someone with a prophetic gift that needed encouraging to allow the Holy Spirit to bring it out more, and I was shown a particular person close by. So I asked her if I could borrow her gift and if she would help me pray for this person. So I asked her not to speak, but to just tune in and receive what the Holy Spirit wanted to reveal while I prayed. So I started praying and, all of a sudden, she started praying in tongues, so I gently stopped her and explained that the principles are the same in the natural as the supernatural – while two people are talking, no-one is listening. Hear me right with this – I love praying in tongues and listening to other people pray in tongues, but some people pray in tongues as a religious ritual for Him to do something when they need to listen, receive and move in faith. So we began again, but she started this religious ritual again but this time whispering it, so I stopped again and I said, “Stop”. I had to smile; she looked like she was going to punch me, so I said it again, telling her to “just be still” and, this time, she held her lips tightly shut and we started again, and when I finished praying, God had healed the person and when I asked her what she received, well, her face was a picture. She told me that she had never received as clear as just then and proceeded to reveal an amazing revelation to the person that we were praying for, and gave them an amazing confirmation. And so I had her pray with me for other people in the same manner, and she was flying with amazing visions, pictures and words for everyone – fantastic! I love to see people move into their gifts and starting to allow Him to work through them by faith. Nothing like a bit of body-building! I received an open vision, while I played my guitar last night, I could see it in the room! I saw a vision of Britain and it was covered in the Union Jack flag, including Scotland and Wales, I took it that it was independent from the EU by this, then a wooden crucifix came out of the heavens like a stake and pierced the very centre of the country, like a statement of claiming territory, and then blood proceeded to pour out from the the piercing, engulfing the entire nation – I believe Arthur Burt and Smith Wigglesworth’s prophecies are on the way, a powerful move of the word and spirit cannot be stopped by political boundaries, the great revival is being prepared. We invited Kev to minister at our Speakers of Life meeting. He began by giving us a host of stories on how Holy Spirit led him to see healings and deliverances. During the meeting everyone started to smell burning, I had to go and check outside to see if anything was on fire, but the aroma of burning was just in our meeting room! Towards the end of the meeting, he turned to a woman sitting on his right and spoke a word of knowledge to her about her spiritual gifts, that she had birthed something that she was involved with pastorally, which she confirmed to be true. He then told her that when she prayed, he knew that she received many pictures because he’d been shown that there was a prophetic gift inside her that needed to come out! He then asked who had the pain in their left eye? And another lady stated that was her! So he asked the first lady to lay a hand on the lady with the eye problem while he prayed and that if she could deliver what God was going to give her as he prayed, to which the lady looked very nervous. Well after he prayed the eye was healed and amazingly the first lady started describing pictures over the now healed lady supporting the words given by Kev, then he continued this format as we progressed the meeting, encouraging the first lady to move out into her prophetic gifting. Another woman asked for prayer, she came because she’d felt so far away from Father God. She wanted confirmation that he was still interested in her! Kev imparted and told her that she had a pastoral gift inside her that she needed to allow the Holy Spirit to bring out, and the woman received a vision of a crown, and the lady who was now moving in her prophetic gift confirmed this with great words and actually describing the same crown! Then the woman being prayed for received the sensation of an actual crown pressing down on her head! So here I am watching ministry where the evangelist was imparting various gifts and ministering healing, while at the same time, encouraging others to grow in their gifts allowing the flow of the Holy Spirit to confirm the truths in signs and wonders to the recipients. He encouraged everyone that we are all qualified to minister, Jesus paid the price for us to become His righteousness and qualified everyone to minister by Him. Another woman asked for prayer, who was not well at all, she had a pain in her neck and had previously been to hospital and placed on a special food diet. Kev looked at her and said that he saw an African water spirit and he rebuked it in Jesus name, and the unclean spirit manifested making a lot of noise, then she rose up out of her chair and fell forward, face down on the floor convulsing, then let out a loud scream before returning to a calm state. Everyone at our meeting was touched and witnessed God move, one of our best meetings we’ve ever had. During our home group meeting 15/3/2017, I was praying for Kev when he stopped me and said that although what I was saying was very nice, he was picking up that God was trying to share something particular with me, but I needed to tune in to God and allow Him to work through me by faith instead of trying to work for Him. So as I closed my eyes and tried to focus, which is difficult for me as I usually try to analyse and reason everything, I became still and felt the Holy Spirit come over me so strongly that I felt drunk with joy, and at one point it felt like someone had placed a finger upon my forehead, but as I opened my eyes nobody was touching me! At that moment, my mouth was filled with words for Kev about how God saw him. Then I felt a sensation on my left hand, which I can only describe as like wearing a glove of static electricity! And as I told everyone what I was feeling, Kev told me to place this hand upon another member of our home group, whose name was Karl, and to impart the anointing. As I did, Karl could feel the same sensation come upon him. It was difficult to take it all in because I was so full of ecstatic joy, but then in the Spirit I described to everyone how I could see a red dot, which didn’t seem to make any sense and I thought that was it, and so I went to move on to the next person, when Kev took me by the arm and gently brought me back to Karl. He said that the gifts of the Spirit are to build up the body and encourage one another and laughed as he said that there was much more than just a red dot. So I placed my hand back upon Karl and the image of the red dot came back to me and, as I focused, the image expanded for me to see a yellow fluorescent vest with reflective bands on it and, as I described it, to my surprise Karl said that it was what he had to wear at work! And then I described how I was being shown a vision of Karl in his jacket praying in a warehouse with his head slightly bowed down and how his other work colleagues who observed him, thought he was down on himself, unaware that he was actually praying for them, to which Karl started laughing and said that’s exactly what he does. At that moment, I felt prompted to tell him that God sees all that he does, and then I moved on to pray for the next person and continued to deliver what the Holy Spirit was showing me to each person in turn, being confirmed by each one. In my whole life, I have never experienced anything like that before. I’m certainly going to try to stop listening to that inner voice of reason, by trying to analyse everything, and instead start to move out in faith. ​One night, the Lord gave me an amazing dream where I was riding a powerful motorcycle, carefully making my way through an extremely large crowd of people towards a stage. There were television cameras and billboards with my picture on them, but my focus was on a beautiful Indian lady who was standing at the back of the stage. I climbed on the stage, took her hands and we started dancing together to the music being played. I was so in awe of her that I was gutted when I woke up! To be honest, I’m someone that doesn’t like being the centre of attention or in the limelight, but I was more interested and hoping that she might be a future partner! A few days later, my mum had a dream that I was packing a suitcase for a long journey to where a storm was brewing, and the “flimsy” buildings that stood in the field there would not withstand this coming storm, for the harvest there was ripe! So by faith, I found the Indian guy after the service, and said that I’d received my confirmation, so what is it that we are going to do? And he replied that we were going to a town called Kovilpatti in India, which in English means “town of temples” or, in my opinion, “flimsy” buildings! He then went on to say that he was setting up a stage for a four-day gospel outreach, with billboards and it was going to be televised too. Just like my dream! Only now, I realized that the beautiful Indian lady actually represented His church there! Not quite what I thought! Well, I received more and more over the couple of months before the event and, at this point in my journey, I’d already witnessed some amazing miracles, but He showed me that I was going to witness a brand new level of signs, wonders and miracles that I’d never had the privilege to witness before. And that’s exactly what I witnessed. It felt like a roller-coaster ride to get to the point of actually being in the hotel room waiting for the first evening of the outreach. My stomach was churning over, in wonder to how it was all going to unfold. I remember messaging Kathie Walters from my room and saying that I felt like I was “freefalling without a parachute, relying on God to catch me!” Her reply was great; she encouraged me to just enjoy what He’s planned and see it like a wedding day. Well as I lay on the bed praying, I heard a song playing in my head, over and over and the lyrics were “I am not forgotten, He knows my name”. I started to sing it, then all of a sudden I felt “tipsy” and gold dust started manifesting in the palms of my hands! Incredible! By the time I reached the outreach I was on cloud 9! The God consciousness made all my self-consciousness fall away, and it was effortless, just to be who God had called me to be, and I entered the “dance”. By the time it came to the impartation, the anointing was so strong that, at times. 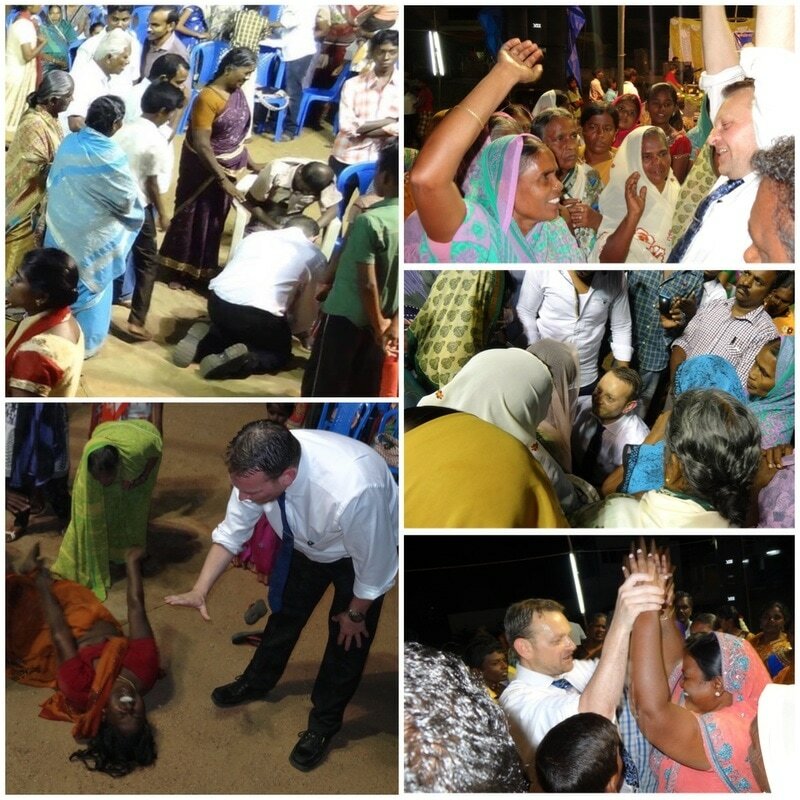 I couldn’t stand up by myself; in fact, the crowd would sometimes have to hold me up while I was praying for people! It was so obvious that I myself could literally do nothing but listen and act on the guidance of the Holy Spirit and the healing angel that was present. I had never experienced anything like it. He said I was going to witness a new level, and I did! I have never seen so many healings and deliverances in one go like this. I was so blessed and privileged to actually witness the blind, deaf and cripples healed in one night! And it continued over the four nights that we were there. I prayed for one Indian lady, and I knew that He wanted her to receive something from Him, but I had to get her to stop her religious striving and show her how to listen and receive by faith instead, which was so difficult with the crowd and the interpretation too, but I did manage to get her to receive. Her face lit up, as she was flooded with pictures and words, while God showed me that she was receiving the gift of prophecy. I encouraged her to pray with me for the next person and, whereas I needed the interpreter to help me minister, this lady was now prophesying over people in her own native tongue, and it wasn’t long before I managed to get the interpreter to pray with us too. Then he started giving pictures that he’d received. It was great to see the ordinary everyday people realize their potential in who they were in Christ and allowing Him to work through them. That lady went on to prophesy over everyone for the rest of the evening! I witnessed droves of people getting set free but, through this tremendous experience, I felt I’d been given a window into the Father heart of God. Amongst all the healing and deliverance, I’d been asked to pray for partners, financial blessings, passing exams and prayers for loved ones to be saved – many wants and needs. But I then came across this lady who had been queueing up for ages, and I asked her, through the interpreter, what she wanted and, while she clutched a Bible to her chest, she started crying and said this, “Please can you help me; I want to know God more but I can’t read.” She so touched my heart; she was the only one at the outreach who didn’t want anything other than a genuine strong relationship with Jesus and, although I’d witnessed the most amazing miracles over four evenings, this was the lady that I couldn’t get out of my mind. To me, this was the greatest miracle of the entire outreach – her complete selfless surrendered heart for her heavenly Father. Now, He can work wonders with that. It was a great honour and a blessing for me to be used for His purpose and to witness His glory, but the truth is that the anointing comes on what He does, not on what we do, so it’s only in knowing Him by faith and loving Him in our yielding that we can serve others by Him flowing through us. You don’t have to be perfect for Him to have a perfect plan for you, but you do need to allow your life to be in Him who is perfect. And all glory, honour and praise be to Him who is the Lord.